I completed stage 3 and tested and all was good, so ploughed on with stage 4. Plugging in the battery I got a blank (but lit) screen. Additionally, no sound. I checked. Re-checked. Re-flowed. Re-checked all my solder points, and couldn’t find anything wrong. I tested the two 100Ohm resistors, and got negative tests, so replaced them with two I have on standby. I have some sound when starting! Wahoo! I try the C-button hard-reset trick to no avail. I check the solder points again. Triple check! Still no joy. I lose the sound again. I faffed this afternoon, eventually re-seating the chip… and suddenly I was able to play a game (no sound)! and then all of a sudden back to nothing. faff again, reseating the chip in the process, and suddenly it’s working again… and then no more. I’m guessing someone is going to say “Check the solder points on the chip housing”, and so I’ve purchased some solder braid (arriving tomorrow) to de-solder the screen. Anyone any other tricks that may work, or at least help to narrow down the suspect area. I made lots of images of the project at multiple stages, and even made a video of the problem. I’ll see if I can upload now. 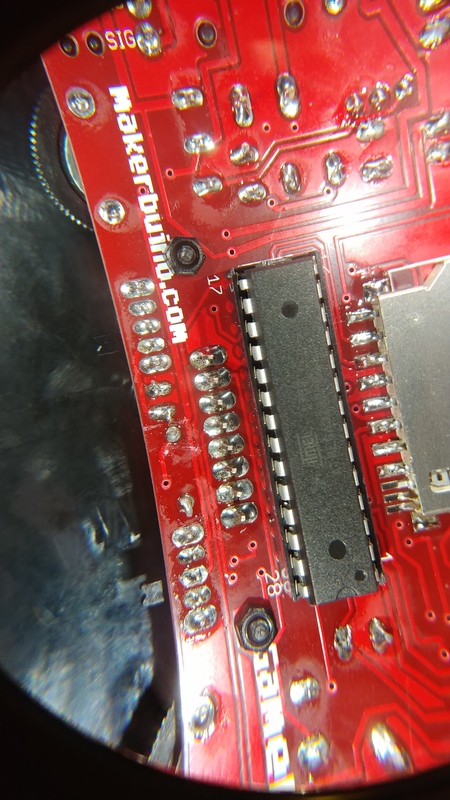 @belial, thank you for supporting MAKERbuino and welcome to the forum. I am sorry that you’re experiencing issues with your build. This all looks very strange as your soldering looks superb. I’ve noticed that the left switch on your MAKERbuino is set in the right position which mutes the sound. Please, unmute it by setting the switch in the left position and tell us what’s happening. And please don’t worry, in the worst case scenario, you’ll send us the unit and I’ll fix it personally. @albertgajsak Thanks for the very prompt feedback. Toggling the switch doesn’t appear to make any difference. I have received the desoldering braid, and am happy to give it a go… but equally happy to ship it back. I’ve already removed the screws holding the screen in place in preparation, but without some guidance, I won’t know if that work is a valid direction of investigation. Please tell me what the most optimal route forward is. Thanks! Send the package as a registered tracked letter using your national post. You only need to send us the circuit board and the screen (do not send the casing nor the battery to keep the weight down). Keep me updated on your progress and send me the tracking number via private messages if you decide to send it back to us. I’ll personally make the console work and send it back to you as soon as possible.